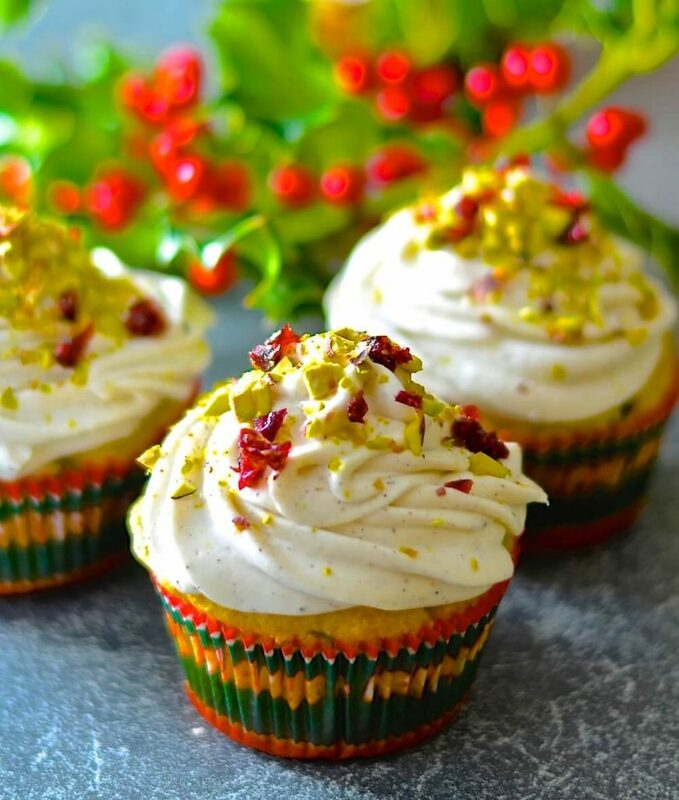 Fragrant & delicious Festive Vegan Cupcakes! 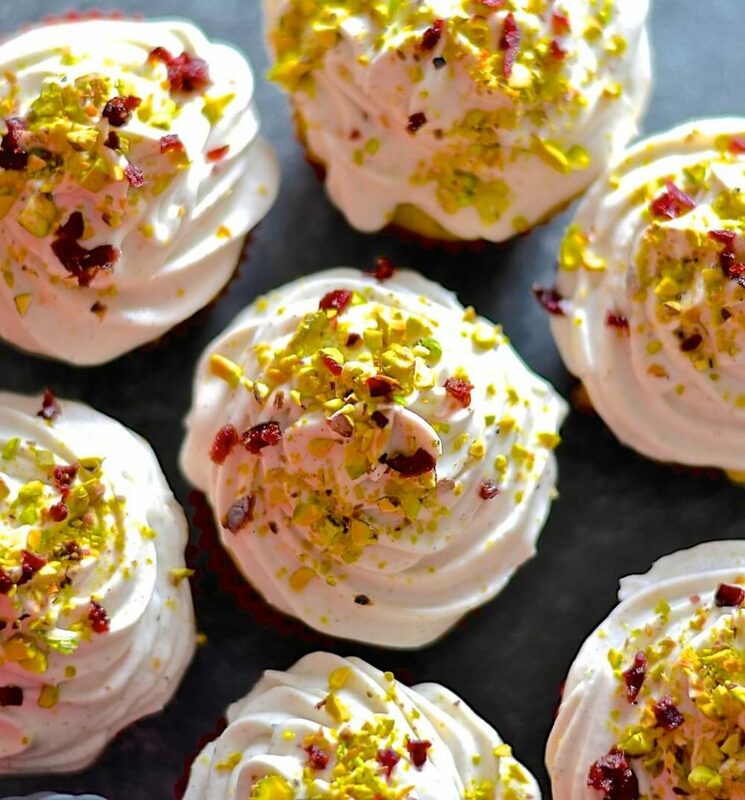 Orange scented, studded with juicy, jewel red cranberries & crunchy, vibrantly green pistachios & finished with a swirl of vanilla cream. Have you heard of the Vegan Mystery Box Challenge? No? Neither had I until a few weeks ago. I read about it in a Facebook group that us bloggers tend to frequent and volunteered myself as it sounded like a fun thing to do. Basically, a group of vegan bloggers are given the same three mystery ingredients and have to come up with a recipe which uses them. Then all the bloggers in the group publish their recipe and photographs on the same day at exactly the same time. Included in that post should be links to all of the other bloggers and the recipes they created so that you lovely readers can take a little tour around and check out all of the wonderful recipes! Our mystery ingredients turned out to be cranberries, pistachios and coconut milk. I was thrilled when I found out what they were as I love all three of them. I thought long and hard about what I would make and had so many ideas. Cookies, a cake, a rice dish…But in the end I decided on vegan cupcakes. And so, I created these wonderful Festive Vegan Cupcakes. I would never have come up with this flavour combination if it hadn’t been for this challenge and I am so grateful that I found out about it and joined, otherwise I would have gone my whole life without ever trying one of these awesome muffins. Oh and ‘one’ is just a figure of speech. You probably know me well enough by now to know that I didn’t stop at just one! 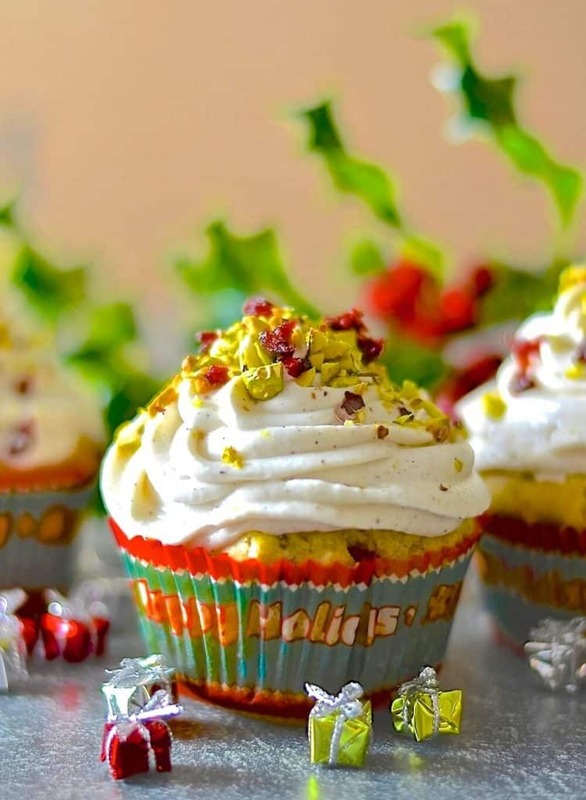 These Festive Vegan Cupcakes are totally and utterly delicious. They are fabulous just as muffins with no topping, but the Vanilla Bean Cream takes them to a whole new level. Start off by soaking the dried cranberries for a little while in some orange juice. This makes them plump and juicy and gives them a lovely orange flavour. Then to make the muffins, all you have to do is add all the dry ingredients to one bowl and all the wet ingredients to another. Then mix. Simple as that! 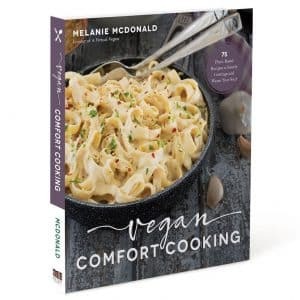 The Vanilla Bean Cream is made with a refrigerated can of full fat coconut milk. When at the grocery store choosing the coconut milk for the cream, shake the cans. You don’t want a really sloshy one. You should choose one that feels like there is something solid with a little bit of liquid in there. It is the solid bit that you need to make the cream. I tend to find that I have more success with the organic varieties. Once you get shaking you will see what I mean. It really must be full fat or the cream won’t work at all. So there you have it. My Vegan Mystery Box Challenge recipe creation is Festive Vegan Cupcakes and aren’t they pretty? It is fascinating to see how everyone’s mind works and how so many different recipes can be made with the same key ingredients. 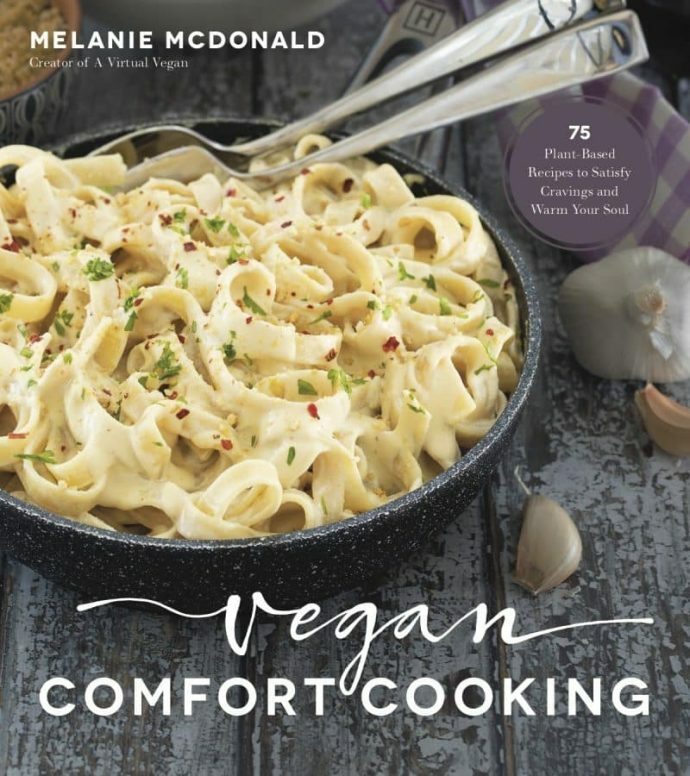 I am really excited to check out the recipes from all of my wonderful fellow vegan bloggers, as I am sure you are too. 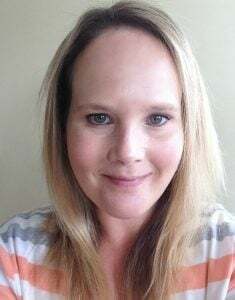 I have so enjoyed taking part in this challenge. A big thank you to Sam from It Doesn’t Taste Like Chicken and Andrew the One Ingredient Chef for setting this Vegan Mystery Box Challenge up. You can check out their recipes, along with all the other bloggers who have taken part under my recipe at the bottom of this post. Show them all some love folks! And for more recipes suitable for the festive period check out the Christmas recipes section of my recipe index. 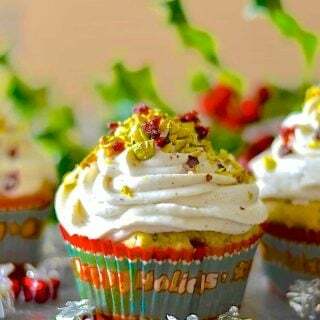 Light & fluffy orange scented muffins studded with juicy, jewel red cranberries & crunchy, vibrantly green pistachios all topped with a swirl of vanilla cream. Festive, fragrant & delicious! 1 tablespoon apple cider vinegar (white wine vinegar can also be used). 1 400 ml can full fat coconut milk , you just need the hard cream on top, (the whole can needs to be refrigerated for at least 12 hours before using). 1/2 teaspoon vanilla bean powder ( You may sub this for 1 teaspoon of vanilla extract if you do not have vanilla bean powder but I do recommend you try to get the powder as the flavour is so much better). 1 - 2 tablespoons orange juice (what was left when you drained the cranberries) if the cream is very thick and needs loosening. Line a muffin tray with liners. I love my silicone liners . They can be used over and over and nothing ever sticks in them. Put the cranberries in a small bowl and cover with the orange juice. Leave to soak for at least 15 minutes. Put the flour, baking powder, baking soda, salt and suagr into a large bowl. Put orange zest, melted coconut oil. milk, vinegar and vanilla into another bowl and mix together. Don't worry if the coconut oil goes a bit clumpy. Just mix it all up as well as you can. Drain the cranberries (keep the leftover juice and set it aside for now) and add them to the wet ingredients. Pour the wet ingredients into the dry ingredients and stir well but not too much. You want it to be just combined so you can't see any dry flour. Over mixing can affect the rise & texture. Then gently fold in the pistachio nuts. Spoon into muffin cases and put into the oven immediately. Bake for around 25 minutes or until a skewer or toothpick comes out clean. While the muffins are cooking or cooling, open the can of coconut milk. Scrape out the hard cream and put in a bowl. Keep the leftover water and add to a smoothie or curry later. Beat with an electric hand held whisk or in a stand mixer until light and fluffy. Add the powdered sugar and vanilla bean powder or extract and beat again until well combined. If too stiff add a drop or two of the reserved drained orange juice to loosen. If you accidentally add a bit too much orange juice then just add a little more powered sugar. The cream will get a little bit loose as it warms up while being whipped. If it's too loose to pipe put it in the fridge to set up a bit, or even the freezer for a little while if you are in a hurry. Either pipe or spread onto the muffins then decorate with some chopped pistachios and dried cranberries. If you have any leftover orange juice you can save it to add to a smoothie rather than waste it. If you cannot find natural pistachio nuts then it is ok to use salted pistachios. I purchased mine from a bulk bin and they were labelled unsalted and natural but when I got home and tasted one they were actually salted. They worked absolutely fine in the recipe. Just reduce the salt to 1/8 of a teaspoon to compensate if this is the case. The muffins are delicious! I was unable to replicate the frosting and ended up with something of a glaze, but it worked! I’ll make these again! Your recipe looks amazing! I have a question though, your recipe name says muffin but in the description you refer to them as cupcakes. Do these come out like cupcakes or more similar to muffins? Just wondering ! I would love to make them as cupcakes if possible, they will be a christmas favorite for sure. They are muffin sized but have the texture of a cupcake (lighter and less hearty than muffins) and of course they have frosting, so they are more cupcakes than muffins. I did originally name them muffins then changed my mind. I obviously missed changing the name in that spot! I just did now. Thank you for making me aware of it! Oh my…. These muffins look so good! And what beautiful pictures as well! Thanks Andrew! Its been really fun. I hope we can do it again at some point in the future! Thank you for arranging it. I love the sound of a vegan mystery box almost as much as I love the sound of these muffins! Gimme! Thank you Sarah. It was such fun and the recipes created are amazing! These really do look good Mel! I especially love the vanilla bean cream (it sounds like it’d be good on just about everything ;)), your little props are so cute too! Thanks Natalie! That cream is great on just about anything or even straight from the bowl! Aren’t those itty bitty presents great! These are freakin’ beautiful! And truly, the combo of cranberries, pistachios and coconut is a great! Thanks so much Jackie! We were given great mystery ingredients to work with weren’t we? Thank you Sam! I really enjoyed it. I hope it becomes a regular thing! These guys look so good! I haven’t made cupcakes in a long time! Thank you! 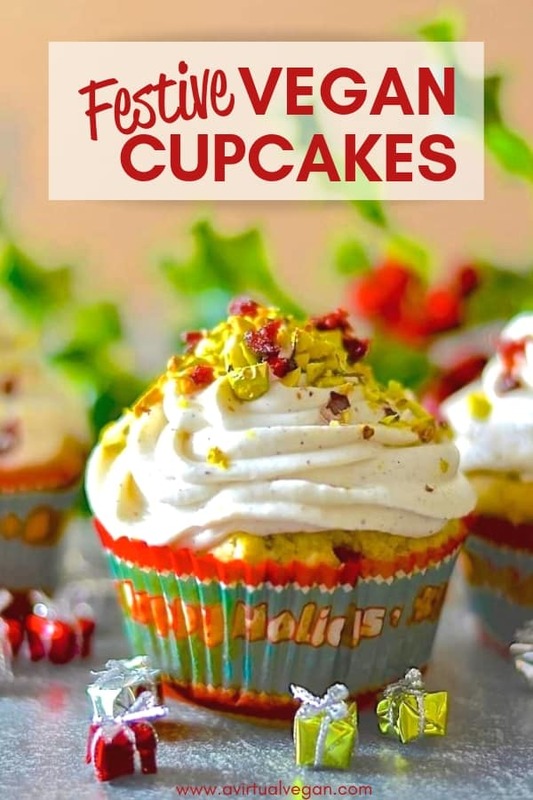 It’s Christmas…you need cupcakes in your life…get baking!! oh my goodness! That cream though <3 Seriously good. So glad I found the recipe! They are sooooo good! The cream is delicious! These look so incredibly delicious! That vanilla bean cream…..OMG! I could eat that with a spoon! And your pics are so pretty! Thanks Jenn! That vanilla bean cream is so good. It nearly didn’t make it to the muffins!